Performing a spin workout is one of the very best ways to get your body burning those calories while working up a sweat. If you are new to spin, then you may be wondering how to maximize the benefits it offers to you. This article is going to give you 7 of the best tips to help you up the ante and receive a better workout, be you a spin novice or a well worn-in vet. You will discover how to ride a spin bike for best results, along with the correct spinning posture. So if you are ready, let’s get started. Spin is an intensive workout, so you will want to make sure that you are well hydrated and have plenty of energy available to power through the class. Think of your body as the engine of a car. If you are running low on gas and moving on fumes, then it won’t take long before the gas runs out and the car no longer works. However, if you fill the tank with high-quality fuel, then it will go much further for much longer. A health carbohydrate snack, such as a piece of fruit or some whole wheat toast around 60-minutes before your workout can help you race through your spin session with ease. Fill up on a large glass of water at this time too, or if you have a clear broth to hand, this is even better. 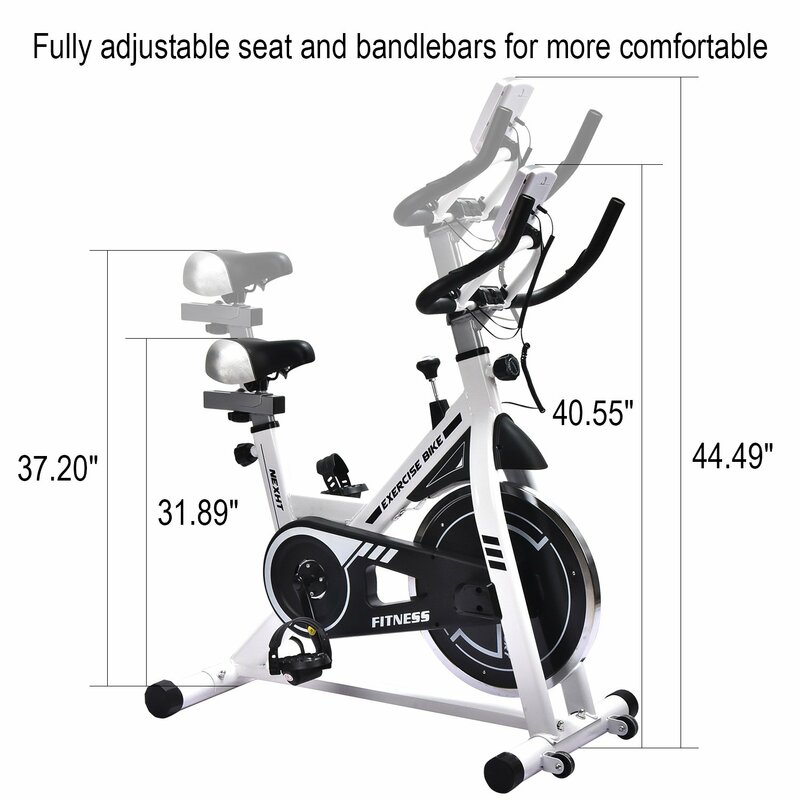 Spin bikes are easily adjustable and should be adjusted to fit your height and frame. The first thing you will want to do is adjust the height of your seat so that your body is able to lean forward to reach the handlebars without stretching too much. You ideally want your back to be flat and not arched. The peddles should reach your feet with ease, while your knees should not be coming above your waist area. Think of the same position you would have while riding a traditional outdoor bike, this is the position you need to adjust your bike to fit. You are not going to want to perform a spin workout wearing anything that is too rigid, rough or synthetic. You want to aim for clothes which hug the body, are soft and stretchy while allowing the body to breathe. A T-shirt and a pair of leggings or shorts are going to be your best bet. You really want to opt for cotton if possible, as nylon and polyester trap heat and sweat, which not only feels gross but can lead to rashes too. Avoid anything that can become trapped in the peddles or in the adjustment bars of the bike. You don’t need to rush off out to buy professional cycling gear, just aim to be comfortable. Shoes also play a vital role in getting the most out of your spin session. You obviously are not going to be able to wear heels while spinning, and you will want to avoid soft-soled footwear. The sturdier and more solid the soles are, the better for your feet it will be. If you truly want to get the most out of your spin session, then you need to imagine that you are the only person in the room. The worst thing you can do in a spin class is to start comparing yourself to the other riders or the instructor. You need to push yourself as if you were 2 meters ahead of the crowd in a bike race with the finish line in front of you. There are no half measures in spin, you need to be focused and power on through, even when it feels as though your legs are about to drop off. This way you can finish your class and know that you gave it 101% and be proud of your effort. Having a great instructor is one of the best things to help you get the most out of your spinning session. If you are not sure about the correct spinning posture, or even how to ride a spin bike, don’t be scared to ask them for help. So, what is proper spin bike form? Well, it is all about the position of your body and hands. It will mainly depend on whether you are sitting or standing, and will most likely change throughout the workout. In the sitting position, you should place the palms of your hands toward the center of the handlebars, your hips should be evenly positioned when sat down. When performing standing poses, which involve going from a seated to standing position quickly, the hands should be toward the curve of the handlebars. You will want to be riding with resistance for the entire workout duration. To ride without resistance will simply equate to the wheel spinning and you failing to receive and benefits. You also run the risk of causing injury to your knees if you go too easy or too hard on the resistance. If it is too easy, then you will have legs that spin like the roadrunner in Wylie coyote. If it is too hard, then you are going to look like your cycling in slow motion. A good place to begin is with around 80 – 100 RPM’s. If you find that you are not enjoying yourself during your spin workout, then you are not going to be putting in 100% effort. Spinning is all about intensity and adrenaline, yes, you will notice others screaming and hollering as if they are on a roller coaster, and you don’t have to join in with it if you don’t want to. You should, however, find it a joy to do. It’s going to be hard at first, but as the old saying goes … no pain, no gain. Previous article Spin Bike Vs Exercise Bike – Which Is Better For Weight Loss?